Textile is the most important manufacturing sector of Pakistan and has the longest production chain, with inherent potential for value addition at each stage of processing, from cotton to ginning, spinning, fabric, dyeing and finishing, made-up and garments. The sector contributes nearly one-fourth industrial value-added, provides employment to about 40% of industrial labor force, and consumes about 40% of banking credit. 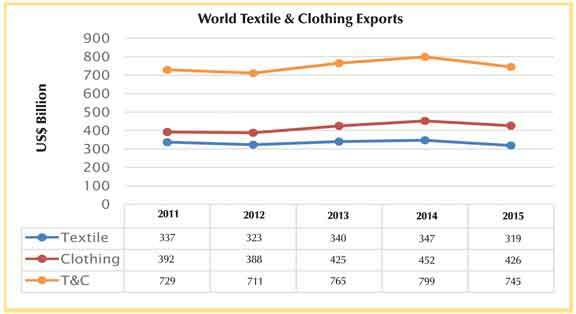 Barring seasonal and cyclical fluctuations, textiles products have maintained the share of about 60% in national exports. Pakistan is the fourth largest producer of cotton and third largest consumer of cotton in the world. In addition, Pakistan is the worldÃ¢â‚¬â„¢s second largest cotton yarn exporter and third largest cotton cloth manufacturer and exporter. Unlike some other textiles and clothing producing countries, Pakistan is unique as it has a self-reliant production chain. From cotton growing to ginning, weaving, processing and finishing, and from fabrics to home textiles and apparel, all have links in the textiles and clothing value chain which have been developed by PakistanÃ¢â‚¬â„¢s own industry. Pakistan is one of the leading textiles exporting countries in the region and got the GSP Plus status from EU countries. Ã‚Â In Annual Fact File-2016, PTJ has collected all information/statistics from various institutions/organizations related to the textile industry to our readers. These statistics give a comprehensive picture of PakistanÃ¢â‚¬â„¢s textile industry including historical charts and graphs. For the interest of our readers we have included international textile statistics.